Prairie Story: "O" What An OPRAH Day! "O" What An OPRAH Day! Our Oprah day finally arrived, and "O" what a day it was! 4:00 am - Alarm and wake up call!! Jumped into shower, then hair, makeup, dressing, and packed up the last few items to check out of hotel. Thanks Omni, we had a wonderful stay! 5:30 am - The town car picked us up... on our way to Harpo Studios! 5:45 am - Arrived at Harpo Studios. It was actually a beautiful morning so standing in the audience line wasn't bad at all. There were about 50 or so people ahead of us in line. Faye and I have been friends for 25 years! Ironic that we see Oprah in her 25th season together. ﻿ 6:15 am - The line started moving, and we proceeded through the check in process which was efficient but still took some time. First coat check, then ID check. We then were handed a release to sign, then on to security where all phones, cameras, electronics, food, beverages and excess items got removed from purses. Then through the metal detector. We were handed a small breakfast and headed up to the waiting room. I must say that all the Harpo staff were extremely friendly! 7:30 am - Names started to get called to enter the studio. From what I could tell these were primarily people who had a connection and were seated in the front rows. The remainder and bulk of the audience were then seated by number. The studio itself feels much smaller than what it looks like on TV. It was cozy without a bad seat in the house! 10:00 am - We had a bit of a break, and then the warm up party started. Music, dancing, and video of Oprah playing on all the screens. We then had the Oprah Store people come in to pitch and invite us over after the show. Lastly, we had the opportunity to ask any questions, like "Will this show be part of Behind The Scenes? ", "What will happen to Harpo employees after the Oprah Winfrey Show? ", and "When will this show air?". 10:30 am - The show began and Oprah entered! She interviewed the director of "I Am", Tom Shadyak. His story is inspiring, enlightening and awakening. I'm not going to lie... I had Kleenex handy and welled up many times thinking that I was at one of Oprah's last 30 shows. It was awesome to be in Oprah's presence and I was so fortunate to see a show that was so meaningful. Please watch the show for yourself, it will air April 20th! Oprah graciously thanked us all and spoke a few words us all before she left. 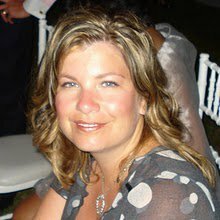 11:30 am - We exited the studio and as we were waiting in line for our coats and valuables, we were approached and asked if we would do an interview on Oprah Radio. We jumped at the chance! Oprah Radio - We headed over to the Oprah Radio Studio which was a separate building where we got a brief tour then were brought into an interview room and were instructed to put on the head phones, take off our jewelry so it wouldn't bang on the table and got comfortable in front of the mics. They asked us questions about where we were from, how we got Oprah tickets, what we thought of the show, what Oprah means to us and what we've learned from the Oprah Show over the years. 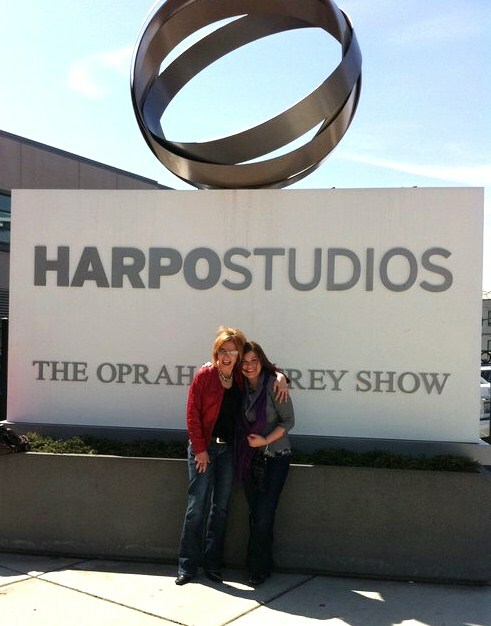 If you have Sirius/XM, you may just hear us next week on Oprah Radio! 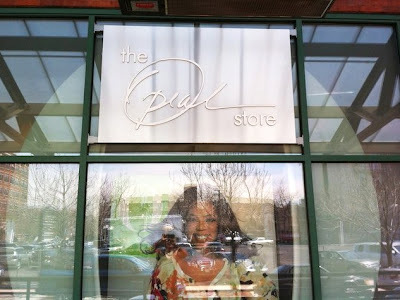 Oprah Store - Our last stop was the Oprah store of course! Unfortunately Oprah's Closet, where you can purchase clothes that Oprah has worn and 100% of the proceeds go to charity, was pretty depleted. I ended up getting a shirt for my daughter, journal for my husband, and a couple sweatshirts for me! On a cute note, I also saw Oprah's dog Sadie! Security detail was taking her for a walk. I just happened to be lingering around Harpo Studio after I was done shopping and pretty much bumped into them as they came around the corner. My entire Chicago trip was amazing! I am so thankful and blessed to have a prairie friend like Faye and am actually still processing my once in a lifetime chance to see Oprah in her Farewell Season. Crazy! I did NOT know you could purchase clothes that Oprah herself has worn?!? That's kind of amazing and a little creepy all at the same time! Wow - what an exciting & memorable day. Thanks for sharing your adventure with us. Friendships like that are to be treasured and what great memories you made! Thanks for sharing all the ins and outs of going to an Oprah taping! And will be listening to your interview! Wow! It sounds like you had a most wonderful day. Lucky you !